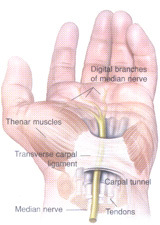 The carpal tunnel is a tunnel in the wrist made up of wrist bones and ligaments. It allows the tendons (these move the fingers) and the median nerve (major nerve of hand providing feeling and movement) to go from the forearm to the hand. This tunnel is already tight so if there is any swelling (eg tendons inflamed, extra fluid as in pregnancy) or the tunnel becomes smaller (eg fractures, arthritis) then the median nerve becomes compressed. This can lead to the symptoms of numbness and tingling in hands and /or fingers; pain in the palm, wrist or forearm; waking person at night with pain in hand; weakness in the thumb and trouble gripping objects. involves taking a careful history and examining the hands. Carpal Tunnel Syndrome can be diagnosed by examining the hand or sometimes a painless investigation looking at the electrical conduction of the nerve; this test is performed by a neurologist. Depending on the cause and the severity of the Carpal Tunnel Syndrome, treatment can be non-surgical or surgical. Non-surgical management includes: resting the hand; splintage of the wrist; anti-inflammatory medication; steroid injection into carpal tunnel. is preferably done under general anaesthetic or arm block (patient is awake but the arm is put “asleep” by an anaesthetist). A tight cuff is placed around the arm to stop the blood while operating. The operation involves making a cut in the bottom part of the hand, dissecting down to the carpal ligament and dividing it. After the skin is sewn back up a bulky bandage is applied. If both wrists are affected then the patient should discuss with Dr Mills whether both wrists should be operated on at the same time. the patient can go home on the same day. It is advisable that someone else is with the patient for the first night. Prescribed pain medication is taken for pain relief. The patient should keep their wrist elevated as much as possible. Bandages are removed after 1 week and sutures removed after 2 weeks. It can be up to 4 weeks before full range of motion is achieved.